Well as you can see, I got my first blueberries of the season! What to make... decisions, decisions. There are too many great recipes to make with blueberries. Should I make the always welcomed blueberry muffins or maybe some scones. Of course blueberry pie never disappoints either. Then there's those lemon blueberry cookies I've been wanting to make. Talk about stress...what a tough decision. 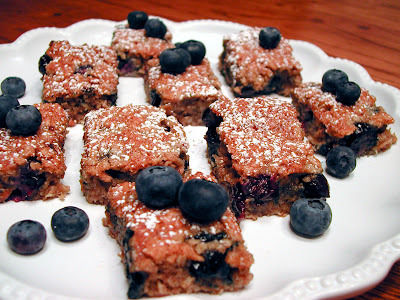 But I finally decided to make some Blueberry Oatmeal Bars. Why? I don't really know. Probably because I have never made them before. Plus, I recently ate some of my Mom's Quaker Oatmeal Chocolate Chip Bars and have been thinking about them ever since. 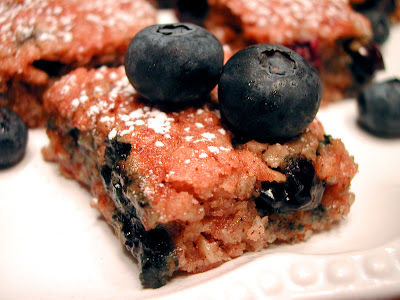 So why not create a blueberry bar using similar ingredients? I was up for the challenge! By the way, they turned out super moist and chewy, flavorful and I think, pretty cute too! Heat oven to 350°F. Place a large piece of foil in a 9 x 13 inch baking pan, overhanging sides. In a medium bowl, sift flour, baking soda, salt and cinnamon. Set aside. In an electric mixer or large bowl, beat margarine and sugars until creamy. Add oil and maple syrup, mix well. Add egg whites (one at a time) and vanilla; beat well. Add sifted flour, baking soda, cinnamon and salt; mix well. Add oats; mix well. Carefully fold in half of blueberries. Spread mixture evenly into prepared pan. Add the remaining blueberries to the top of the mixture, pushing berries in lightly. Bake 28 to 35 minutes or until light golden brown. Cool 20 minutes in pan; remove to wire rack by lifting up sides of foil. Cool completely. Cut into 24 squares. Sprinkle with confectioners sugar. Store tightly covered in the refrigerator. Oh YUM! I know I would like these. Oooh, they've got oats! So they're sorta good for you. Which means I could eat about five of them and it would be totally fine, right? Sneaking "Healthy" Into Your Food, One Entree At a Time! I love the challenge in creating something delicious that is also healthy. It's even more fun when I trick people into thinking that what I made is fattening and unhealthy, because it tastes too good to be "good for you". Making Healthy Food Delicious... Without the "Healthy Taste"!